You will most likely take part in a development centre as you progress from front-line to managerial roles, or from a general role to a more technical or strategic role, often as part of an organisation’s graduate management programme. As a participant of a development centre your preparation will follow the same approach as that for an assessment centre and specific preparation relevant to any internal promotional activity is discussed in greater detail in later chapters. They will actively be involved in assessing themselves.They will be required to assess and give feedback on the competencies of other participants.They are given detailed feedback on their results and what they mean for their future development.They will be expected to ‘own’ the development requirements as part of their Continuous Professional Development. The role of the assessors is focused more on facilitation and identification of the competencies that participants need to acquire or develop. 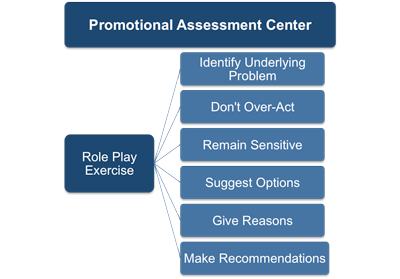 The way in which the assessors score an individual during an exercise will emphasize their developmental needs rather than their competency to perform a specific role. This may alter the nature of the exercises so that the developmental aspects are emphasised. If you take part in a development centre, you can expect there to be more emphasis on your abilities to explore or brainstorm an issue or the potential of a situation; rather than simply to display particular competencies. It is important to focus on why you are taking part in such a centre and you may wish to assess your own level of competencies before your development centre. Many centres also use a technique called ‘Domain Mapping’. This is where you identify where you want to be in a particular skill or level of knowledge, e.g. become a Senior Consultant. You then work out a staged plan of personal and professional development of how to get there through discussion with your assessor or your peer group. Throughout the development centre you will have ‘Evaluation Sessions’ where you will be given feedback on how you performed compared to the competencies of your potential future role. Many internal candidates perform below par because they neglect to familiarise themselves with the latest internal policies, procedures and interpretation of the organisation’s mission statement. They also forget to review their personnel file, which will provide important clues as to how their strengths and weaknesses are perceived by others. If you want to manage your career within an organisation, then you must prepare for all internal assessment as diligently as you would for any external opportunity. Many people forget the importance of their preparation when attending internal assessments as they feel there will be no surprises during the process. Experience often shows that these interviews are equally tough and in some ways more challenging than external ones. Organisations are obliged to ensure that all recruitment is operated fairly and frequently incorporate ‘Assessment Day(s)’ as part of their internal promotional. You will actively be involved in assessing yourself. You will also be given your results from the centre and expected to own the development requirements as part of your Continuous Professional Development (CPD). You will be required to assess the competencies of the other participants, or candidates. In this instance the assessors would alter the nature of the exercises so that the developmental aspects required for the role were emphasised. In some of the exercises, the assessing team might perform the role of facilitators to ensure that the participants bring out all the competencies required. If you role is of a more technical nature you may also be required to take a similar tests on your spatial ability, and possibly your mechanical reasoning. The results of these tests will then be discussed with your assessor as to where your future potential lies and where the main focus of your personal development should be focused (e.g. A Management, Research or Technical role). If you take part in a development centre, your role will be one where there is more emphasis on your abilities to ‘explore’ or ‘brainstorm’ an issue or the potential of a situation; rather than be expected to display a particular competency. Many centres also use a technique called ‘Domain Mapping’. This is where you identify where you want to be in a particular skill or level of knowledge, e.g. become a Senior Consultant and then ‘map’ where you are now e.g. line manager. You then work out a staged plan of how to get there through discussion with your Assessor or your peer group, These stages are likely to involve both personal and professional requirements. This means that you are not in a ‘Pass or Fail’ situation, which you would be in an assessment centre. Throughout the development centre you will have ‘Evaluation Sessions’ where you will receive feedback on how you have performed and how that compares to the competencies of your potential future role. It is still important to prepare for this type of centre by having a clear understanding of what a typical role’s competencies are. Many internal candidates perform below par because they neglect to familiarise themselves with the latest internal policies, procedures and interpretation of the organisation’s mission statement. By neglecting to use an internal promotion as an opportunity to review your personnel file you deny yourself the chance to prepare arguments and evidence of how you have continued your development. It is also a useful reminder of possible incidents that may be focused on during the assessment centre that have perhaps been forgotten. If you are attending a development centre remember that your new boss will use your personnel file in the same way a potential external employer will use your curriculum vitae (resume). They will use these items to make an initial assessment of your capabilities. So you too should review its contents as a key part of your own preparation for the event. If you want to manage your career within an organisation then you must prepare for all internal promotions as diligently as you would for any external opportunity. Many people forget the importance of their preparation when attending internal interviews as they feel there will be no surprises during the process. Experience often shows that these interview are equally tough and in some ways more challenging than external ones. Organisations are obliged to ensure that all recruitment is operated fairly and frequently incorporate ‘Assessment Day(s)’ as part of their internal promotional. All of the preparation described in the following chapters is relevant to your internal promotion and you should follow the same preparatory tasks. This may be either a panel or with one interviewer, or sometimes a series of interviews with different assessors. Interviews at this stage are likely to be more in-depth than those you experienced during the first stages of selection and could be with someone from the department to which you are applying or even with a potential future colleague. Questions may refer back to your first interview, to assessment centre activities or to aptitude or personality test results. Panel interviews are regarded as a more objective means of assessing your suitability as you will be interviewed by between three and five people and therefore the decision is not reliant on just one person's opinion. In addition, they are usually more structured than a one-to-one interview as the panel need to assess all of the candidates against the same criteria. You should prepare for a panel interview in the same way that you would prepare for a one-to-one interview, but remember to greet each panel member with a firm handshake at the beginning of the interview. You should also look at all of the panel members when answering a question, whilst making the majority of the eye contact with the person who asked it. You will usually be asked to assume a fictitious role and handle a particular work situation. Role Plays usually use professional actors who are clearly briefed about their role and how to respond when you take a particular approach. A role play exercise allows the assessors to see if you can play the role that is necessary to address the situation they have created. You may need to make a conscious effort to overcome your natural responses in these exercises. For example, the assessors are looking to see whether you can exhibit sensitivity or toughness in those situations that require it, not whether you are a naturally sensitive or tough person. Most role play exercises will involve you interacting with another person or group of people to resolve some issue. The role play scenario should reflect the needs and concerns of the organization. If the organization needs a change agent, then the exercise may require you to convince reluctant subordinates to accept a new idea. Conflict resolution, problem solving, and interpersonal skills are at the top of the list of things that are usually measured. Composure, decision making, organizational skills, job knowledge, leadership, sensitivity, and supervisory skills may also be assessed. There are many ways to succeed at role play exercises but there are two vital points that you must keep in mind. In many cases, you will be presented with one or more ‘symptoms’. This could be a customer complaint or an under-performing subordinate. You need to identify the underlying problem straightaway. Why is the customer complaining? Why is the member of staff under performing? Identifying the underlying problem is the essential first step to taking the necessary remedial action. It is also important to use an approach that you are comfortable with and that you feel will best accomplish the goals appropriate for that situation. Role play situations may call for a wide variety of approaches. The approach that you might use in dealing one-on-one with a poor performing subordinate may be wholly inappropriate for addressing a large group of upset customers. The important point is that you need to stay in control for the duration of the exercise – so don’t start something that you can’t finish.